پازوکی, شهرام. (1392). احیای علم در مثنوی معنوی. دوفصلنامه جاویدان خرد, 10(24), 5-28. شهرام پازوکی. "احیای علم در مثنوی معنوی". دوفصلنامه جاویدان خرد, 10, 24, 1392, 5-28. پازوکی, شهرام. (1392). 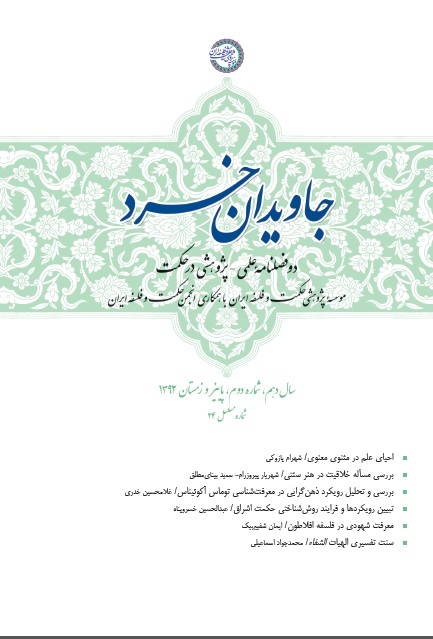 'احیای علم در مثنوی معنوی', دوفصلنامه جاویدان خرد, 10(24), pp. 5-28. پازوکی, شهرام. احیای علم در مثنوی معنوی. دوفصلنامه جاویدان خرد, 1392; 10(24): 5-28. از مسائلی که در سنّت تصوّف و عرفان اسلامی به آن توجّه بسیار شده است، مسأله علم و دانایی است و شؤون و مراتب آن و تفاوت دانایی حقیقی از نادانی‏ای که خود را دانایی می‏نماید و اینکه چگونه می‏توان به این دانایی حقیقی رسید. از این‏رو یکی از مساعی اصلی عارفان مسلمان، خصوصاً به هنگامی که علوم دیگر به نام علم مشهور می‏شوند، احیای علم حقیقی است. کتاب احیاء علوم الدین امام محمّد غزالی یکی از نمونه‏های اوّلیه و بارز این تلاش است. مثنویمولوی نیز از یک جهت، احیاء علوم‏‌الدین دیگری است. مولانا در این کتاب شریف در عین اینکه به مصادیق حماقت و نادانی اشاره می‏کند و اصناف نادانان و احمقان را برمی‏شمارد، علم و عقل و مراتب آن و رابطه میان علم و جهل و آن جهل را که علم می‏نماید و ارتباط میان این علم با علوم دیگر را نیز معیّن می‏کند. One issue which was the center of attention in Islamic Sufism and mysticism was knowledge and sapience and its aspects and hierarchy, the difference between the real knowledge and sapience and ignorance which shows itself as wisdom, and how it is possible to achieve such a sapience. Hence one of the attempts of the Muslim mystics was –especially when other sciences were considered as a knowledge- to revive the real knowledge. The book entitled ‘The Revival of the Knowledge of Religion’ by Muhammad Ghazali is one of the primitive and obvious examples of such attempt. There is in one respect resemblance between ‘Mathnawi Maʽnavi’ and ‘The Revival of the Knowledge of Religion’. While Mawlavi shows the examples of benightedness and refers to the groups of benighted people in this noble book, he determines the knowledge and intellect and its hierarchy, the relation between sapience and ignorance and demonstrates the benightedness which shows itself as a sapience. He also refers to the relation between knowledge and other sciences. In this paper, I tend to delineate the hierarchy of knowledge such as narrative, intellectual, heartfelt, experiential and mathematical ones and their relations with each other and determine the boundaries of each of them. Furthermore, I consider the relation between the real knowledge and sapience in Mathnawi with the concept of knowledge and consciousness in the modern age. I also examine briefly the question whether mystical thought – as some Muslim intellectuals claim- has hindered the progress of science in the history of the Islamic civilization?